I believe it is always a plus to support a company that is actively trying to reduce their carbon footprint. I have always been a big Nike fan and have had at least one product made by them since I can remember. I will feel better knowing that they are trying to reduce their footprint. It makes me wonder if the quality of their shoes will change as this was the main reason I supported Nike so much. It would be great if they can find a way to produce the same quality product while still going green. I think its really beneficial to use the bluesign technologies for Nike. This would be the right thing to do for Nike. it would save Nike allot money also it would be better for environment. I have grown up use Nike products and really love the company see them help environment great.If Nike starts doing allot of other company might doing it to. This is a very interesting article and a great post! I think Nike is moving in the right direction by going green. 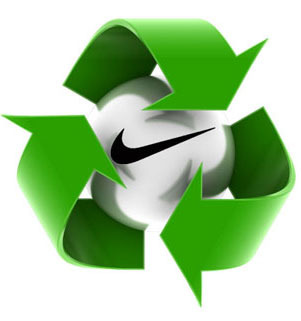 Reducing their carbon footprint will have a positive worldwide impact because Nike is a well known and used brand. Green products are extremely popular right now this could be a good move for them financially and environmentally. Spr1313perna brought up a good point, would going green decrease the quality of their products? I highly doubt Nike would produce an inferior product. Nike has always produced a quality product and will probably maintain their integrity to their products. Once Nike goes green, would they able to go back without backlash? I love this article. I think it’s great the Nike is taking a huge step towards going green. This will definitely have a huge impact worldwide. This also gives them a competitive advantage towards other competition and companies. I believe this will also a good move financially especially since this would most likely reduce costs while making a great impact upon the environment. Big Nike fan. Some of the best gear whether it is clothing or shoes. I think this is a great initiative going green. Many companies are revolutionizing the way they work by being more proactive with world. However, going green usually comes at cost because it always not an easy alternative. Look to see that Nike may increase prices by a bit. .
Big Nike fan. Some of the best gear whether it is clothing or shoes. I think this is a great initiative going green. Many companies are revolutionizing the way they work by being more proactive with world. However, going green usually comes at cost because it always not an easy alternative. Look to see that Nike may increase prices by a bit. I think this is a really good move for Nike. As everyone keeps saying, going green is the new trend and is here to stay. However there have been many stories in the news about how poor the working environment is in Nikes factories. I think going green is a good start, but they also need to focus on how they treat people and improve working conditions. Interesting post! Nike is taking a positive move in not only making environmentally friendly products and increase efficiency, but also as a way to help their manufacturing image a bit. Though, I do agree with the statement above, that Nike still needs to really address and focus on the issue of the ill working environments for factory employees. Very interesting article, It’s nice to see big companies such as Nike take the initiative to be environmentally friendly and at the same time improving their products by implementing new technologies. Using the technologies mentioned above will definitely improve Nike’s to produce more sustainable products and increase efficiency. I think Bluesign Technologies will be beneficial to Nike. As the author mentioned, the new technology will improve Nike’s supply chain by being “more innovative, stable, and of higher quality.” This can cut costs in the supply chain for Nike and give it a better competitive advantage in the market. I also think that the environmental factor in the technology will also enhance Nike’s brand name, and will also contribute to it’s competitive advantage.